Smoking cigarettes or pipes are no longer vogue for writers. And, there was a time in history when writers didn’t smoke: take Homer for instance, who lived pre-tabacco. Of course, he was probably cranking pages with chisel and rock and couldn’t hold a pipe properly. For a short spell during summer, the year I hung out with my cousin T., we roped, rode horses and chewed tobacco. We even rode our horses to the country gas station and bought a can of Skoal despite being only 12 and 10-years-old. My first romantic kiss was with a cowboy who tipped back his hat and shared his lip full of chaw with me. I never mastered spitting and I never did see that cowboy again. Probably a good thing. And no one ever offered me a cigarette. So I never smoked. I never had to learn what it was to quit a thousand times. Yet, there are smokers in my life whom I love. I refuse to lecture or give them gruesome tales of their future demise. I grew up in a shame-based family and I’m not about to dose it on others. They go to movies–they see the advertisements and the curl on the lip of the passerby when they light up in their designated areas. What I learned from the smokers in my life is that smokers readily share stories and camaraderie. I once traveled cross-country from Minnesoto to NYC and back by train with a smoker. Our conductor smoked too, so she promised to knock on our room when we were stopping long enough to light up. I went too, despite hands in pockets. I just listened. So one day, I decided to smoke, too. I went to designated smoking areas and lit up. It’s nice to smoke–you get a break, time to chill and unwind. Non-smokers never get that, always uptight and working on the clock. Smoking lets you light something on fire and watch slowly as it chars. It’s like meditation. Of course, I don’t smoke cigarettes. I’ve got too much of a sweet tooth for tobac so bitter. I smoke marshmallows. Seriously, I do. I’ve always favored S’Mores, so when I took up the habit Jiffy Puff became my brand of choice. In the first months of quitting my career to write along the south shore of Lake Superior, I posted this photo which I entitled, ‘Smoking and Drinking.” The drink of choice at the time was San Pellegrino sparkling mineral water. It’s true that such vices are gateways. I now drink Presecco when I can afford it, but I’ve been known to drink Brut champagne when I can’t. I’m hooked on the bubbles. For a while I was smoking the huge marshmallows, but I cut back to the originals. Now truly I set out to post something worthwhile tonight. But after having a rough day I sat out on the porch to smoke and it reminded me that Australians have been deprived of S’Mores. Therefore, in enlightenment of my friends down under, this Recipe From the Ranch involves smoking marshmallows. Of course, you don’t have to go full out flames and charcoal. 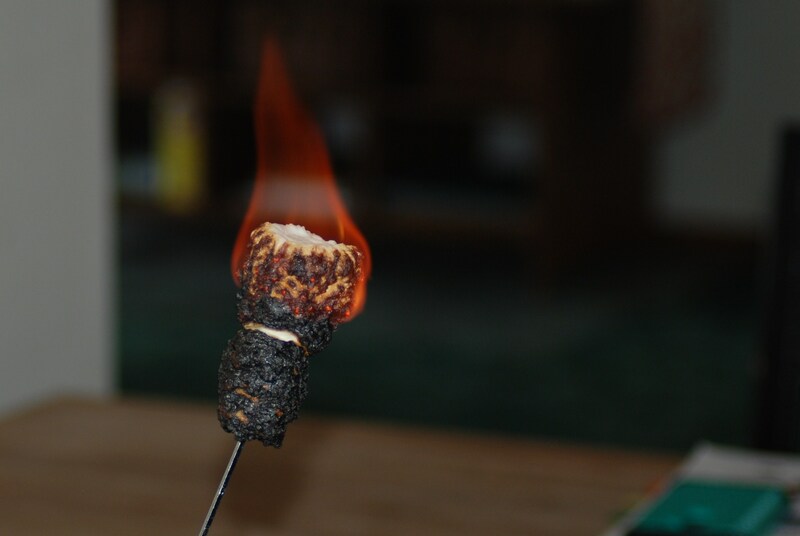 You can daintily toast your marshmallow inches from the flame and let it slowly brown. That’s what the Hub does, but then again, the Hub gets his smoke fix from a cherrywood pipe. You can also microwave a marshmallow for 10 to 15 seconds, but that just seems weird. Kind of like, lighting up a Marlborough in the nuker. The following recipe is courtesy of Hershey’s. Stateside they must sell a ton of bars during the camping season. 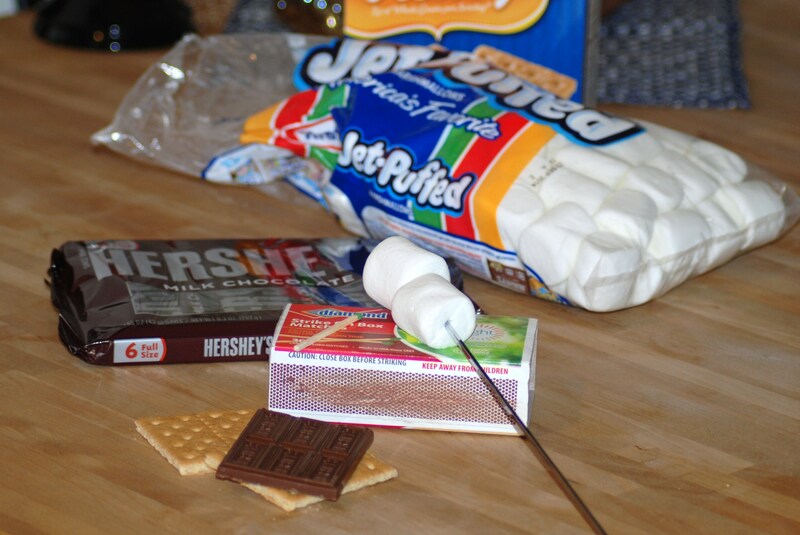 No child in America goes camping or out to the backyard fire pit without the plea for “some more” marshmallows and chocolate. 1. Top two graham cracker squares each with one chocolate bar half. 2. 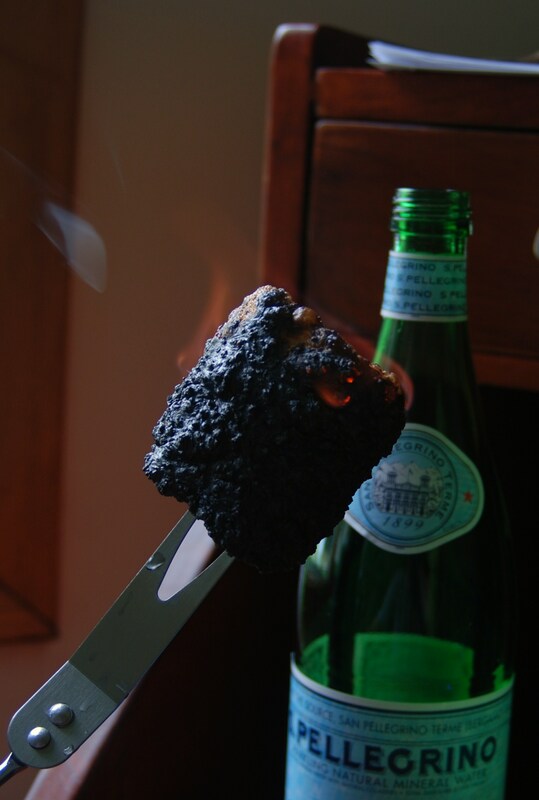 Light up two marshmallows on a long metal skewer until the flame dies out and marshmallows are crusty black. Or toast alongside the fire until barely brown. 3. 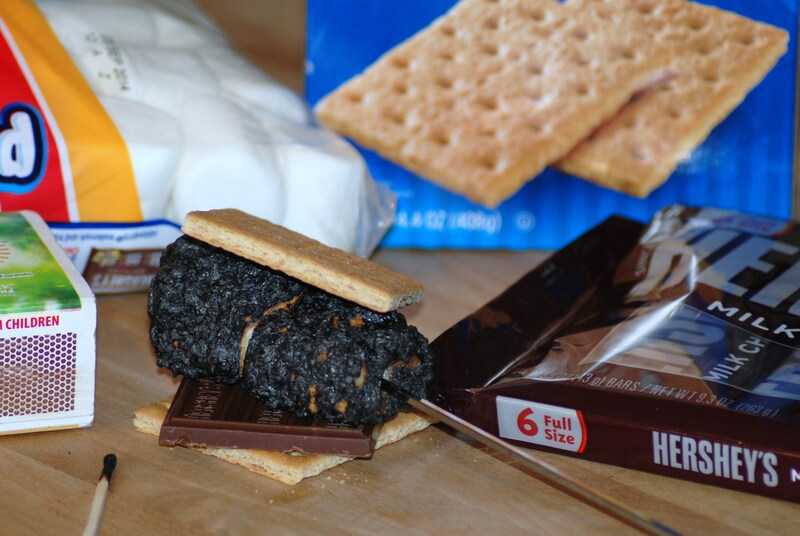 Carefully slide one marshmallow onto each chocolate-top graham cracker square and top with a second cracker. 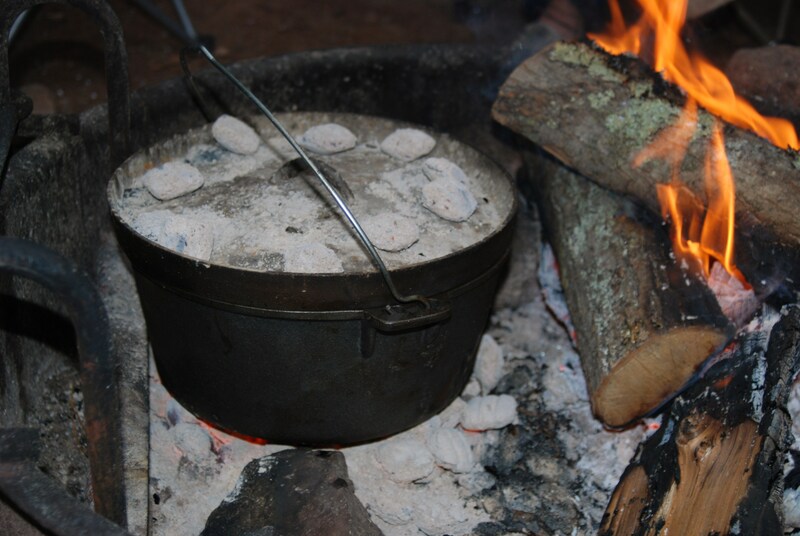 As unappetizing as it sounds, Dump Cake, is mainstay Dutch oven cooking. 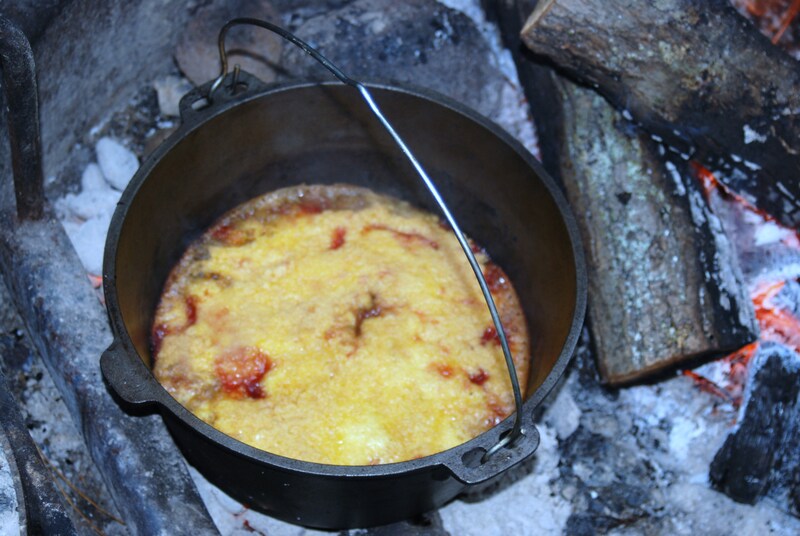 Last week, Lisa Reiter of Sharing the Story, stirred up our memories of camping which led me to think of the camping cake that requires no stirring. That’s what a Dump Cake is–dump in the ingredients; no stirring required. 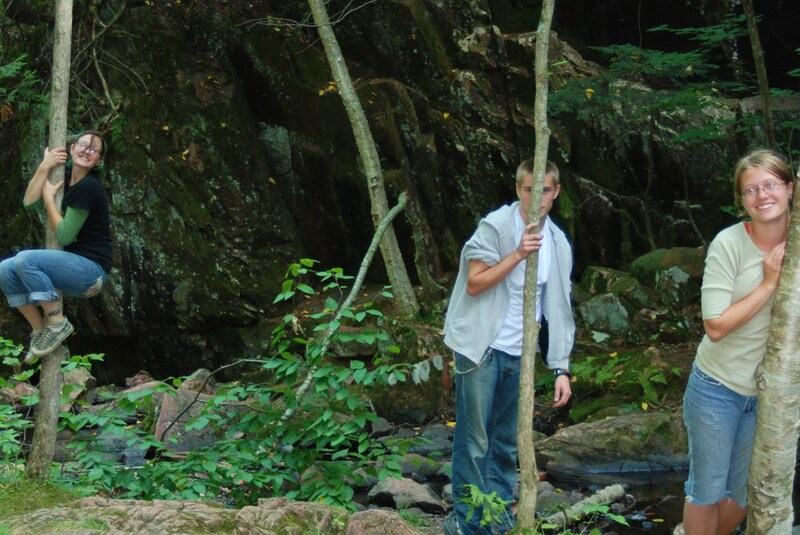 In 2007 my family camped in the northern forests of Wisconsin at Birch Lake. My kids were still kids then, as my eldest, Allison, was perched to fly the family coop. Kyle, the youngest was turning 16 and Brianna was going into her senior year of high school. It was trip that stirred my memory of fun family times in my Bite Size Memoir No. 5. Because we were camping, the Dutch oven was working overtime. My husband grumbles that I bring the kitchen sink and I respond, “No, I bring the whole kitchen.” The kids tell him to hush and eat. They don’t mind packing the extra iron, utensils and food because we all like to eat like kings around the campfire. A Dutch oven is a large cast iron pot with a flat lid. You can hang it over an open flame, set it on a grill or even snug it into coals. The latter is required for baking. Ten years prior to this camping trip, in 1997, I was the writing intern for Montana Fish, Wildlife & Parks. It was one of my first freelance gigs and I was covering an event called “Becoming an Outdoors Woman.” Being a buckaroo, I grew up outdoors and was no stranger to logging camp meals and cowboy coffee. Today, I share with you Mountain-man Johnson’s recipe for Dump Cake. It’s all in getting the coals white. Notice that we had half our fire pit dedicated to coals, the other half to wood. 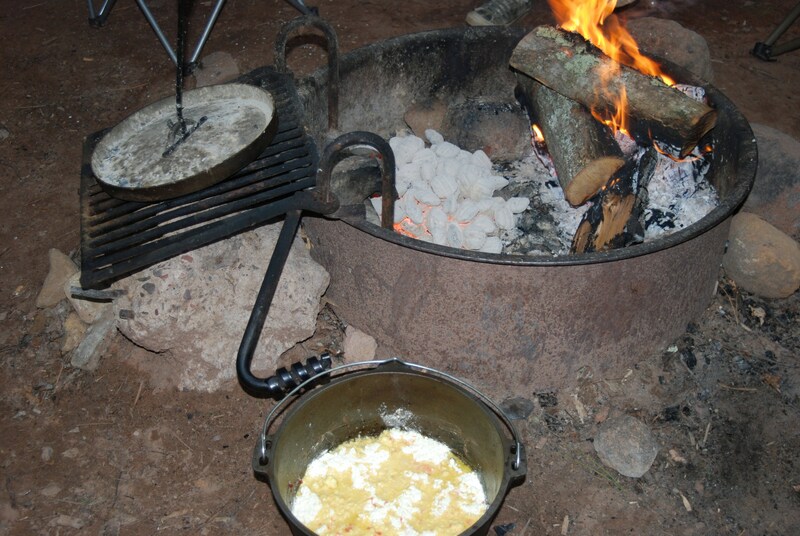 We aren’t fancy when camping, so just set that Dutch oven in the dirt and lightly butter the bottom. Add one can of cherry pie filling. Next, spread one box of yellow cake mix over the fruit. Melt one stick of butter and pour it over the mix. Don’t stir. Just “dump” the ingredients in the order given. Nestle the Dutch oven into your pile of white-hot coals. Add a few coals to the lid, scattering evenly as you can see in the photo above. Bake about 10 minutes before you lift the lid to check progress. Your Dump Cake is ready when the fruit bubbles up around the edges. When it is, remove it from the coals, but set the lid (with coals) back in place until the top is browned. Decorate if you’d like, as we did. Slice and serve like brownies. 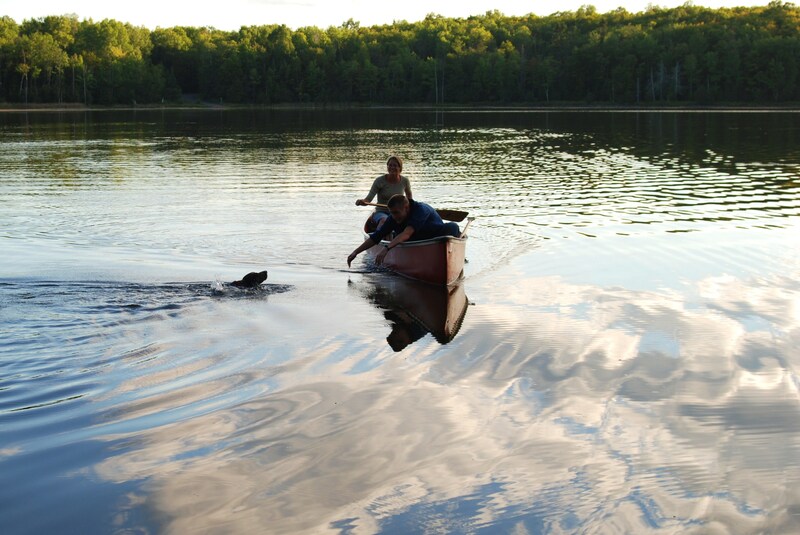 And that’s Bobo swimming for the canoe, not Nessie. But if you like magical creatures, join us for the June 4 Flash Fiction Challenge: June 4, 2014 prompt: In 99 words (no more, no less) write a story that includes a fantastical element or creature. Respond by noon (PST) Tuesday, June 10 to be included in the compilation. Since being off-pond nearly three weeks, I’m hungry. Hungry for the view of the pond from my apple tree, hungry for the first fruits of my garden, hungry for writing. Yet, I’ve been filled. Filled with the love a Mum has for her children no matter how old they are or what they are doing. It’s easy to say I’m proud of them when they’re making terrific leaps in life. But I’ve also been here long enough to understand that they struggle, too. We all do. Life is like a rhubarb season. Rhubarb grows where planted, but comes into fruitfulness slowly, within it’s own timing. Rhubarb has amazing fruit, but toxic leaves. Life is like that, too–the good intertwines with the bad. So we bake cake! Another metaphor for life–make something tasty out of it. Preheat your oven to 350 degrees. If you have a Kitchen Aid like I do (and yes, I brought it with me when I drove over to Montana) just toss all the ingredients except the rhubarb into the mixer and mix until creamy and smooth. That’s the easy buckaroo way. My son-in-law is a talented baker and would first cream the butter, then add the sugar, wet ingredients and finally the dry ingredients. 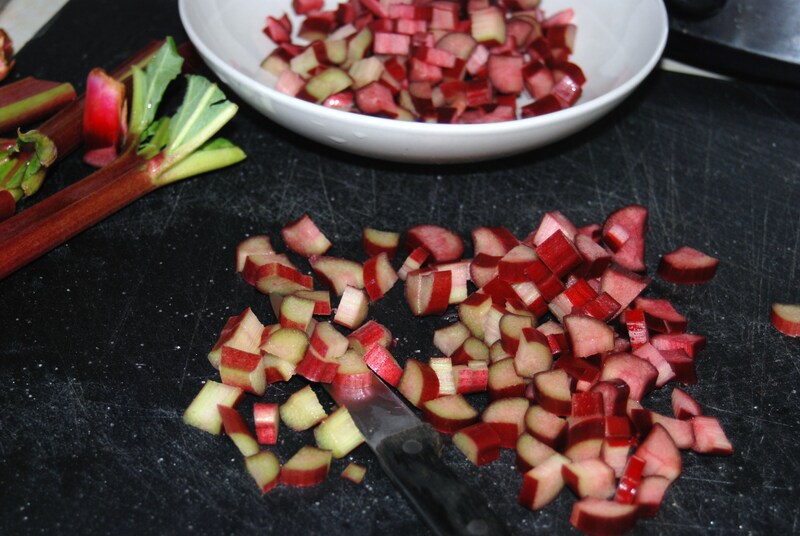 But we both agree on folding the chopped rhubarb in at the last. Pour the mixture into a 9” x 13” baking pan and bake for about 45 minutes. Give it the finger-press-test: gently press a fingertip to the middle of the cake. If it leaves no indentation, then it is done. Set on a rack to cool. The following is a snack cake (no frosting needed). Easy, tasty and fulfilling! 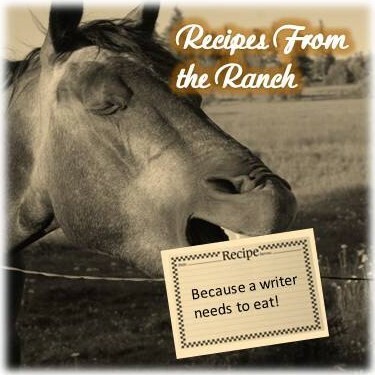 Meat and potatoes is a recurring theme in a ranch kitchen. When you live in Idaho, potatoes are the official state food. With so many ranches, beef is a close second. Tri-tip is a west-coast cut. When this buckaroo lived in the Twin Cities of Minnesota, few butchers knew the cut. Even if they did, they cut different styles from that portion of beef so it was never available. Tri-tip is a favorite for those who smoke and barbeque, but it is also a quick steak. My husband often works contract out of state and my kids are grown and flown. At times it’s just me and the dogs. Left to my own devices, I’d just write and poke about the pond all day, neglecting kitchen duties. But I’m not a fan of canned or boxed meals so I try to fix things that fit my tastes and my writer’s life. 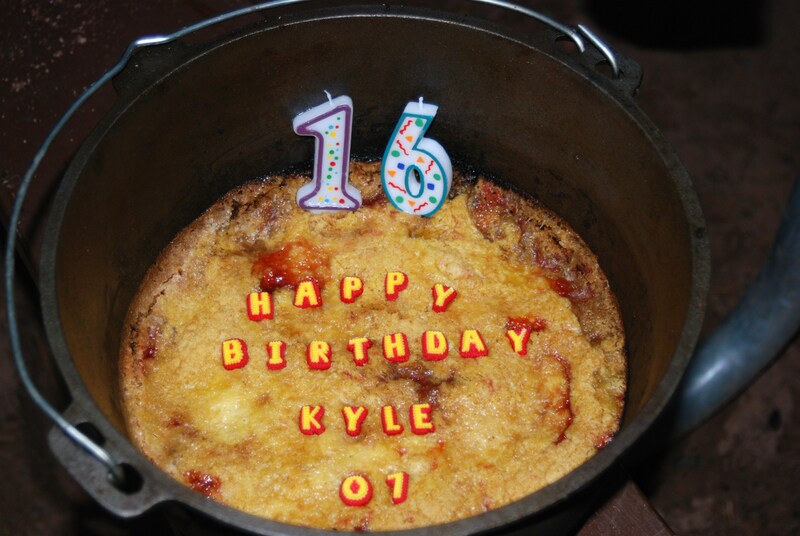 That’s one reason why I like to bake potatoes. In the oven it takes about one hour. That means I can fix the potato then forget about it and write some more before prepping the rest of the meal. Another reason I like baking potatoes is that I can prepare one at a time for my single meals, but easily add to the count when I have a full house. Same with tri-tip steak. I can slice up a tri-tip roast into writer-buckaroo sizes or prepare the roast for more guests. Versatility is desirable in the ranch kitchen. This recipe serves up well with a side of asparagus because it’s spring and asparagus is tender and fresh at the stores. My husband grew up in northern Nevada and picked asparagus along the ditch banks. It’s still one of his favorite vegetables, but he missed out on this one! Preheat the oven to 350 degrees. Chop garlic and melt butter (easy to do in 20 seconds in the microwave or a few minutes in a frying pan). Scrub the skin of the potato and set on a cutting board between two wooden spoons. Cut the potato as if you were slicing it, but stop when the knife hits the wooden spoons. This allows the potato to stay intact but “fanned.” Place fanned potato on a piece of tin-foil (enough to securely wrap the potato). Drizzle the garlic butter between slices and sprinkle with salt and paprika. Seal the foil and bake in the oven for 1 hour. Remove, sprinkle with Parmesan cheese. Super easy–during the last 15 minutes of the potato baking, heat garlic butter in a pan (cast iron or steel is ideal). When I chop the garlic for the potato, I chop two more cloves and reserve for the steak. If you really like garlic (as I do, chop even more and roast it with the asparagus in the oven that last 15 minutes of baking the fanned potato). Once the garlic butter melts, slather both sides of the steak in it. Fry each side about 6-8 minutes (depending upon your preference). Salt and pepper with freshly hammered (cracked) black pepper. Every kitchen buckaroo needs a hammer for cracking pepper! Serve and eat and then go write some more. Spring is subtle. While it’s difficult to capture the exact moment when grass greens or to know when the last snow squall will cover tilled sod or early peas, the light has returned to our days noticeably. I’ve read that it is light, not warmth, that triggers the return of migratory birds. This explains why robins show up, pecking at piles of snow. Warmth, we can still gather from our ovens. And from a shot of whiskey. On these spring mornings when the ranch pastures are coated with heavy frost, bread pudding seems like a direct line to heaven. Whiskey Bread Pudding is versatile. You can use up stale bread or cinnamon bagels. When company comes a’calling you can let a loaf of French bread harden on the shelf and then break it up for bread pudding. In addition to using different breads, you can change the flavor profile easily. Sometimes I’ll toss in a cupful of frozen huckleberries or add raisins and cinnamon. Tomorrow, I’m making pumpkin bread pudding for guests to serve with linguica for breakfast. It’s supposed to be a cold spring day so we’ll enjoy the warmth of bread pudding and who knows–maybe we’ll splash a little whiskey into our coffee cups. Preheat your oven to 350 degrees. Tear apart a stale baguette (about 5 cups) into a 13″ x 9″ baking pan (ungreased). Mix remaining ingredients until smooth, like pumpkin-colored satin. Pour mixture over the bread. Bake for about 40 minutes, until an inserted butter-knife pulls out clean. You may need to bake 5 to 10 minutes longer. You can serve this with whipped cream or whipped cream and Whiskey Sauce. Why not? It’s spring and it’s still chilly! Melt butter, add sugar, yolk and water into a small saucepan. Cook over medium heat, stirring constantly with a wooden spoon until it boils and the sugar crystals have dissolved. Remove from stove and add whiskey. Serve warm over warm bread pudding. While warmth is the key factor to yummy bread pudding, whipped cream forms best with cold utensils. I place my Kitchen Aid whisk and bowl in the freezer for 10 minutes before whipping up the cream. Or you can use a buckaroo cheat–Cool Whip. A friend in Minnesota regularly posts anything-bacon on my Facebook wall. She knows that a buckaroo likes her bacon. One recipe looked hot–as in spicy-hot-wings-hot. The first time I fixed it, my husband insisted that it required at least two beers to finish eating his plateful. Yep, it’s hot and you can tone down the heat by reducing the amount of Tabasco Sauce. But don’t skimp on the bacon. Preheat your oven to 350 degrees. Any recipe that calls for crushed peppercorns, get your hammer. Seriously. Place the measured amount into a small baggie and set on a stout cutting board. Hammer the pepercorns until crushed. Using a large mixing bowl, mix butter, garlic, seasoning and hot sauce. Toss the potatoes in the bowl, coating them well with sauce. Spread potatoes in a single layer on a baking sheet, and roast in the oven for 25 minutes. Turn potatoes with a spatula after 15 minutes. In the meantime, cut up the bacon into small squares and fry until crisp. Drain on a paper-towel draped over a plate. Chunk the chicken, shred the cheese and dice the green onions. When the potatoes are ready to come out of the oven, carefully slide the potatoes and sauce into a rectangular 2-quart casserole. Layer the chicken, then cheese, then bacon, then onions on top. Cover with foil. Bake at 350 degrees until the cheese is bubbly, about 30 to 40 minutes. Heed this ranch kitchen warning: the sauce the potatoes are roasting in is mighty hot. When you open the oven to flip the potatoes, there will be steam and there will be Tabasco laced in that steam. Be careful not to singe off your eyebrows, scald your face or blind your eyes. And don’t let that warning frighten you. If you like buffalo chicken and bacon, you will love this casserole. Serve it with a wedge of iceberg lettuce, celery stalks and cool, ranch-dressing. When your mouth gets hot, swallow some cold amber lager or lemonade.